Dot-it-spot-it shows response in the range 0.1 – 5 ng BSA per dot. Using 0.5 µL sample + 0.5 µL dilution buffer per dot, the test can quantify in the range 0.2-10 µg BSA/mL. Compare to other total protein tests: Pierce Coomassie (Bradford) Protein Assay with Micro Microplate Protocol shows response in the range 150 – 3750 ng BSA per well. Using 150 µL sample + 150 µL reagent per well, the test can quantify in the range 1-25 µg BSA/mL. 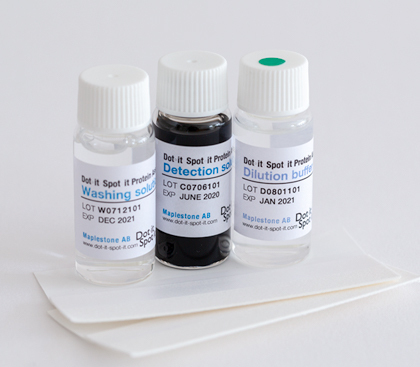 Dot-it-Spot-it is an ultra-sensitive total protein assay! Dot-it-Spot-it is an easy-to-use kit! March 2019: We introduce a new kit for 18 dots per detection sheet.